Earlier this summer, I had the unexpected opportunity of participating in an archaeological dig on the Sea of Galilee. Before two weeks of early, early mornings and hot days on our dig site, we had about a week to visit other sites in northern Israel: Megiddo (Armageddon), Beit She’an, and several ancient synagogues. As a self-admitted mosaics geek, the sites were particularly interesting — many of them had beautiful floors in the various stages of restoration. What I wasn’t prepared for was the religious-political conflict. Or, I should say, I wasn’t prepared for the specific kind of religious-political conflict we walked into… Certainly I was ready to answer student questions about the Israel-Palestine debate, and to discuss why our archaeological site (near the Golan Heights) still had areas with land mines. What I got, instead, was archaeological vandalism. 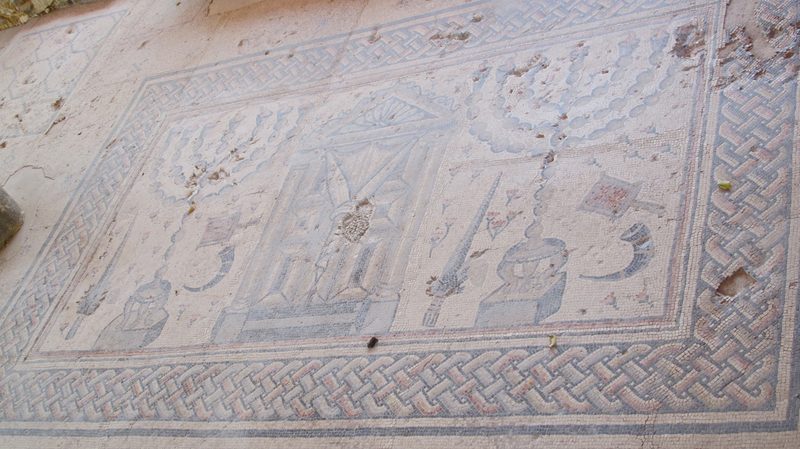 The day before we visited a famous synagogue in Tiberius, the site was vandalized (note the damage done, courtesy of a pick-axe, to the mosaic above). The perpetrators were likely ultra-Orthodox Jews, protesting ongoing excavations at archaeological sites around Israel because of the possible desecration of graves on those sites. Graffiti near the damaged mosaic read “a site for every grave desecrated,” and “for Shuka” (probably “for” Shuka Dorfman, director of the Israel Antiquities Authority). Our dig, about twenty minutes from the Tiberius site, would certainly fall under the ‘troublesome’ category — the excavations at Bethsaida cover centuries worth of habitation, and the site itself has been vandalized in recent years. It was easy for all of us – students and professors alike – to condemn the destruction of the mosaic at Tiberius. After all, the site was excavated almost 100 years ago, and the loss of even part of the synagogue mosaic seemed like a pointless (at best) way to protest modern digs. At the same time, the larger issue of excavating grave sites is something I feel a complicated sympathy towards: I’ve always had a fascination with archaeology and – in particular – forms of burial, yet it strikes me as an innately problematic issue in the larger field of religious studies. Certainly if someone were to dig up the local cemetery, they’d be arrested (and considered more than a little sacrilegious), yet simply because people no longer believe in many of the ‘ancient’ religions we excavate, those burial sites are up for grabs. Anyone with some knowledge of indigenous religious cultures has to start drawing parallels between these protests and the ongoing question of excavation and repatriation of remains in the United States. Working the site at Bethsaida between these two incidents placed the trip firmly into a category that I didn’t expect and, in the mostly-silent days of excavating, gave me quite a bit to think about. My trip to Israel was, in some ways, far less politicized than I ever expected an Israel visit to be. Yet, as a scholar who usually doesn’t participate in the hands-on aspects of research, it brought up some important questions that I’ll have to deal with in the future. This entry was posted in Alyssa Beall, Politics and Religion, Religion and Society and tagged archaeology, Armageddon, Galilee, Israel, Palestine, Tiberius, vandalism. Bookmark the permalink. Your (unconscious?) choice of the more clinically technical “excavate” for the act of unearthing “their” graves and the less professional “dig up” for doing so to “ours” tells the whole story of your post.